(CBS/AP) PHILADELPHIA - The Philadelphia District Attorney has announced new charges against three suspects accused in an alleged Social Security fraud scheme in which police say mentally disabled people were held captive in a basement. Seth Williams announced Friday new charges of aggravated assault, kidnapping, conspiracy and other counts against Linda Ann Weston, her daughter Jean McIntosh and Eddie Wright. Prosecutors say these news charges stem from the abuse of a 19-year-old woman who was locked in a bathroom closet for at least two weeks. Weston, Wright, McIntosh and a fourth suspect, Gregory Thomas, were arrested last week. They're accused of preying on mentally disabled adults, locking them in a basement and taking control of their disability checks. All four had initial court hearings this week. They have not entered pleas. 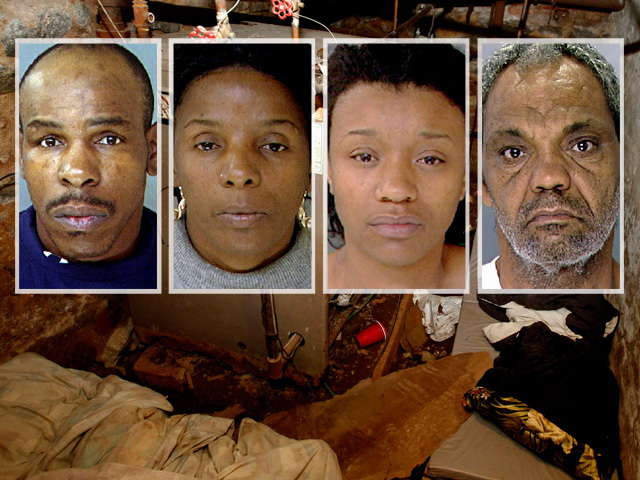 On Oct. 15, a landlord discovered the victims in the dank boiler room of his Philadelphia apartment building. Police said the disabled adults, who have the mental capacity of 10-year-olds, were malnourished. One of the adults was chained to a boiler.